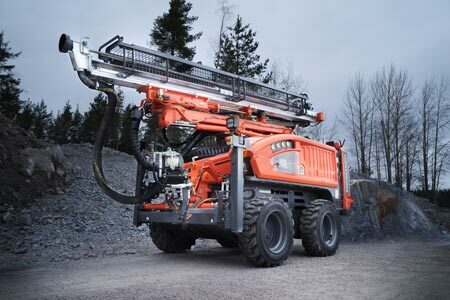 The new Commando DC130Ri – a rubber tired compact size top hammer drill rig - is the latest addition to Sandvik Construction’s surface drilling product offering. The new machine includes a large number of upgraded features developed through consultations with customers, while the foundation of the unit is based on the series of drill rigs launched in 1988. 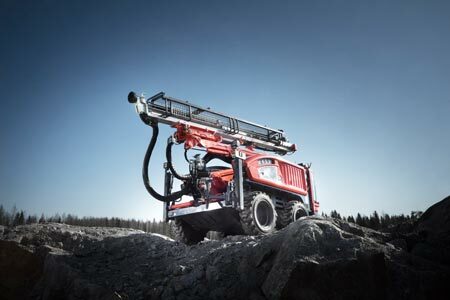 It is in fact the years of experience that guarantee a versatile, highly productive drill rig combined with intelligence and top-rated mobility. Modular design and practical layout of components, new efficient rock drill and a new intelligent control system with large on-board touch screen, are the core features of the new machine. The fully remote-controlled, hydraulic and self-propelled compact size drilling unit, with 4-wheel carrier, is designed for drilling 22-45 mm holes. But this isn’t all; the new Commando DC130Ri has been built on the feedback received from customers that has resulted in nearly 100 practical changes and upgrades that make this unit really a user friendly - must have - drill rig. A completely new RD106 rock drill providing a high 5.5 kW output power, and a new intelligent drilling control system, form the basis for Commando DC130Ri’s high penetration rates. 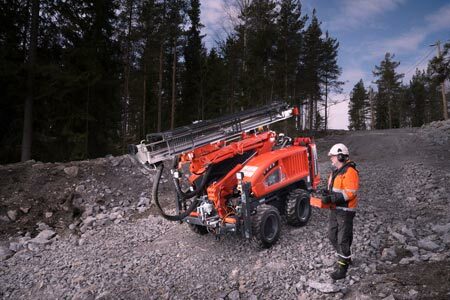 Performance is further enhanced with the machine’s large drilling coverage area, and a new forward pointing feed that allows it to drill closer to structures than before. The machine also possesses the functionality to have roll-over for the feed, change drill steels on the rock drill, and to adjust the drill rig to challenging environmental conditions with additional appliances such as the fuel powered engine heater. All this ensures that the Commando DC130Ri is a truly versatile drill rig that is easily adaptable to changing job sites, and different drilling applications. These include road construction, demolition works, secondary breaking, foundation drilling, trenching, shaft sinking as well as dimensional stone quarrying. The new intelligent control system of the Commando DC130Ri provides modern machine control features that until now have been found only on larger drill rigs. Intelligent engine control provides operating cost savings through lower fuel consumption by optimizing the engine power based on actual requirements. The advanced drilling control guarantees smooth drilling, and is gentle to drill steels. High performance is further enhanced by being able to increase percussion pressure while drilling without sacrificing rock tool life. The 7” (175 mm) on-board touch screen enables effective monitoring allowing changes to machine functions. It provides different views for adjustment, aligning and drilling, as well as diagnostics for trouble shooting purposes; a practical feature that helps the operator to accomplish the work required even more easily and smoothly. The Commando DC130Ri may also be equipped with several optional control system features, such as the torque control and automatic feed-percussion-follow-up, which enables automatically adjusted drilling in varying conditions. Additionally, the new control system enables the use of the TIMi aligning and inclination system as well as the SanRemo remote monitoring service. In machines of this size class mobility, transportability and stability are essential features that really count. From its initial development, the very first Commando was built to meet these requirements. Being of compact-size and light-weight construction for easy transportation, the new Commando DC130Ri is equipped with four high-torque tramming motors, and skid steering that makes the unit extremely mobile. The machine is well balanced, with an optimized center of gravity which means it is able to reach steep slopes without any problems. In case of higher inclinations, a hydraulic winch with automatic rope tension control is available as an option. For added drilling stability, the Commando DC130Ri comes with extendable front ground legs as a standard. Commando DC130Ri has a completely new modular design and component layout that allows easy reach to all service points and components. The whole carrier is divided into four main modules, which can be dismounted when making major overhauls. Furthermore, the better collective placement of the hydraulics, and optimized location of the electrical cabinet, has allowed the hosing to be significantly reduced and the electrical wiring minimized. A completely new cover system has two large side doors with gas springs, and a removable middle roof section that provide easy, and two-direction access, to all service points. 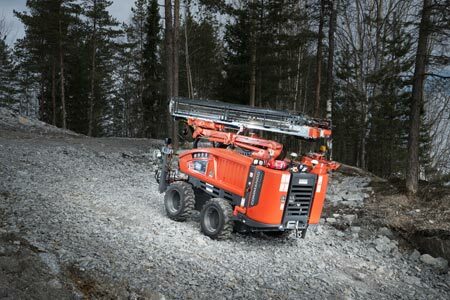 More features adding to the user friendliness and the safety of the machine are the practical radio remote controller with the optional Remote Screen Solution, display lights for the on-board screen, and efficient working lights for the drilling area, as well as for each sides of the machine. The Commando DC130Ri is equipped with fuel-efficient and low-emission CAT C2.2 Tier 3 engine.